A big reason Jordan encouraged me to work on transitioning Born Just Right from a community to a non-profit community came from a huge realization. As Jordan learned more about design this past year, the more we saw how a lot of the inclusive design world is supported by typically able engineers and designers. There are many people jumping into the inclusive design world but most have no personal experience of what it is like to live in the special needs world. Many people we’ve met through the year couldn’t even conceptualize life without two hands. The default reaction is to help build “hands” for Jordan or kids like her. There are many times when those hands are cool and can be fun. But I’ve written before that 3D printed designs aren’t the ultimate solution when it comes to prosthetics or adaptive tools. 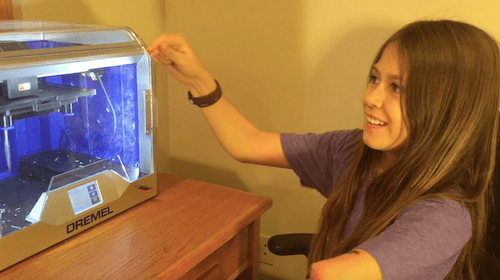 Since Born Just Right’s story has grown, we are getting a lot of requests to promote events to connect limb different children to people who want to give the kids a 3D printed hand. I will make those connections when the events let the kids learn how to make his or her own designs. That’s our goal. I know it feels really good to build things. But I hope Jordan and I can help advance that energy into education and empowerment. All kids have a chance to take ownership of their own design needs. Not just Jordan. We’re twisting the concept of 3D adaptive design just a bit. But I think it’s important. UPDATE: Just to be clear. If you are interested in building a 3d designed hand with E-Nable or Enable Community Foundation, we are happy to help make the connections. But I cannot be the person who is tracking down kids to help every group of 3d makers create hands. I will promote every event that gets kids involved in the design process.